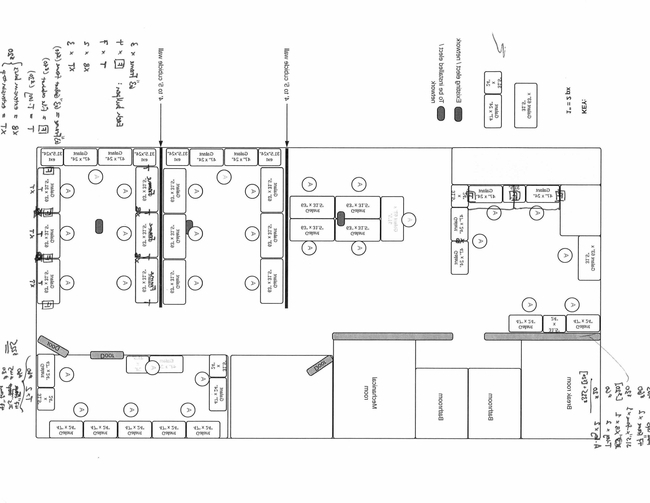 For years, users have been asking us to release a floor plan shape library. It seemed like a natural fit for the product, but some team members questioned if there was really a need for it... that is, until we had to do some floor plan designing of our own. Above is our CEO's attempt to create a diagram using Lucidchart's basic flowchart shapes. It's not pretty and, worse, it's not terribly functional. In our new offices, we had a lot of open space and truckloads of IKEA furniture. The problem was that Lucidchart didn't provide a way to accurately represent the dimensions or measurement of either. Luckily for both us and our users, it was back to the drawing board. And today, the new shape library is alive and kicking! So why should you use it? 1. Until now, most of our shapes expanded and contracted in the same way: Just grab from the corner to resize. That approach doesn't work with walls. So in the new floor plan shape library, walls can split, change length, or snap together with a single click. You can even input the desired wall width on certain shapes, like cubicles. 2. All elements are automatically scaled to size. Our measurements are in feet & inches, and metric measurements are coming soon! Built-in footage for walls, doors, chairs, tables, and other shapes makes it easy to get an exact idea of what your floor plan will look like in reality. 3. We've included Smart Shapes that respond exactly how you'd expect. For example, when you drag out certain bathroom shapes, you can input the desired quantity of sinks or toilet stalls. If you're charting out, say, an airport's floor plan, this little feature could save you hours of unnecessary labor. 4. The choice to include certain shapes came from several group brainstorming sessions. While the hive mind can have negative connotations, these sessions helped us dream up some unexpected shapes that many other floor plan generators don't feature. Think pianos, throw pillows, specialized chairs -- even a bassinet. And since we want our tool to be useful for our users, not just us, we welcome your suggestions for more shapes and functionality! Just leave them in the comments below.